Multi-level marketing(MLM) has been known to me for a while, but lately it’s been front row and centre of my attention. Purported to be the new revolution in sales and marketing and superseding the 1980’s stigma of the pyramid scheme, MLM has allegedly empowered a legion of everyday ‘folk’ to turn into predacious sales personal. These folk turned MLM recruiters flow around like a virus flowing through veins and looking for prospective people to infect and sell products to, however, MLM are just pyramids that sell products (more on this below). My first initial exposure to MLM was ACN a MLM that sold various utilities. By exposure I mean, someone tried to get me to join but I declined, but my recent exposure to MLM was from a business called LIFE Leadership (stylized as LIFE). How I met the young enterprising man was through a bizarre random encounter at a public park. My first encounter was seemingly very authentic and warm, for a few minutes we were just two guys talking about financial independence, superfluous credit and the general state of the economy. But that façade faded with the full assault of what he was really about: trying to ‘reserve’ a spot for me in the down line. As we parted ways (and at the time I still hadn’t quite figured out his game) he let me borrow a book called ‘the Financial Matrix’ (reviewed here) and we set a date in the future to meet so that I could give the book back to him. At the time of planning I didn’t immediately realize this date was going to be the sales pitch, I figured it out after reading the book and investigating the book’s author: Orrin Woodward. At first I thought this was a genuine connection, but after finding out that it was a MLM I knew his ulterior motive. I read the book (in one sitting, it was very short) and then we met at a local coffee shop, after I declined to join the team, we met again and I gathered some good information, from the face to face meets and from the internet and the conclusion I came to was this: LIFE (and MLM in general) is dangerous, here is why. Life Leadership is a MLM that doesn’t sell knives, utilities or Tupperware, it sells self-development materials usually manifested as a book or a CD (because people don’t read anymore, the actual reason given by Life Leadership representative). The other thing that LIFE does is recruit more people, so they can sell more stuff. The LIFE website and product catalogue says that LIFE can develop 8 areas (the 8 F’s): fun, faith, family, finances, fitness, followings, freedom, and friends. Inside the glossy LIFE catalogue there is the line “Learning to live your dream life”, followed by “Where are the holes in your life?”, the paragraph underneath names off potential problem areas in your life (marriage woes, distant families, money stresses, etc). These claims are so vague (you can make your dreams come true simply by reading or listening to these books!) but I can’t fault anyone for trying to better themselves and the best place to start is with better information. But my website is dedicated to frugality, which means not wasting money and getting more ‘bang for your buck’, which means there is always better ways to procure information than this LIFE material. Besides in the coffee shop the LIFE pitch man was not talking about how to better my faith, my relationships, but rather how crisp the dollar bills were going to look in my wallet. Their whole pitch was about money, so let’s look at the money angle. The LIFE business man started reciting stories about people in the local area, how they were able to shed the cocoon of their monotonous toil at the dirt factory. He told me about a couple of people who grew jaded of their well-paying jobs and how they were able to turn their decent lives into super lives by being Life Leadership partners. Where were these very successful people? Not in the coffee shop trying to recruit me and of course the guy I talked to was still working his day job and LIFE was a hobby for him, but if LIFE was pulling in the bacon why not do it full time? The answer is simple: it’s not pulling anything in except debt. This is where ‘leading by example’ is important, the LIFE representative made ridiculous claims about how my financial independence was just a turn of the key away, but he was not living the big picture dream that he sketched out for me. I was already skeptical of MLMs long before I met with LIFE, but if I knew nothing of their unscrupulous past the fact they were not living their pie-in-the-sky caviare wishes would be a red flag for me. I suppose small town humility and honesty are to blame for their inability to drive up to the meet in a rented (or leased) BMW and wearing Gucci suits, paid for with credit cards (fake it till you make it?). From the LIFE website for Canadian members a typical participant’s earnings are estimated to be between Cdn 60 and1,215 annually. If you think of working a MLM as a job, this is unacceptable. It also unclear if this figure is before, or after expenses, since you have to pay for the product you sell. I could be wrong about this, but the LIFE rep was probably his own best customer. Additionally some research indicates that in many MLMs(in this case Amway) 99 percent of people lose money in them – in other words participants spend more money than earn. At least if you work at McDonald’s you will have a net profit working for Ronald McDonald. 28% of members are at the very bottom rank, they are the grunts of LIFE, they have the rank of “student” and make an average of $25.82 a month (that is twenty-five dollars and eighty-two cents), of course that is an average, the ‘high’ figure for the lowly grunt is reported to be $162. While not as empowering as having your own ‘business’, panhandling probably nets more income than the lowly LIFE student. The next rank above student is “student 150”, the 150 represents roughly how much volume they sell, each item has a certain amount of points attached to it, so a ‘student 150’ sells 150 worth of points. At this level the average monthly income was $37.23 for student 150. This shows that even if you do sell product you make basically nothing. Even the high scoring students are making on average $200-$600 a month, although some high performers are taking in a few thousand, they are the tiny elite. Student 15,000 which is the highest rank of student according to this income disclosure statement make up only 1.110% of the organization (the only people making money are the one percent). 40% of members leave after one year. In the call centre industry – the soul draining enterprise that it is, sees 26 percent turnover. A rate significantly higher than the call centre industry probably indicates that it is not a good business. If everyday life is so much better in the MLM garden, why would 40 percent of people leave their first year? Imaginably so, MLM enterprises look like a leaky bucket chasing lost members. Most people have probably heard of the 1 percent and 99 percent dichotomy, in LIFE leadership 8 people are at the top and they make 69 percent of the average monthly income. This is worse than the 1 percent of Americans, who have 34.6% of America’s wealth. As my title indicates toiling away in Life Leadership results in getting someone else rich, not you. I can’t speak for all MLMs, but Life Leadership certainly cut to the chase, the whole point is to get rich. The LIFE rep who talked to me, who worked manual labour as his day job told me “People give us their goals and then we work to achieve them” He told me he’s been in the business for two years, but he still works his manual labour job full-time, two years and he is still grinding away at his day job (which is confessed he hated so much). As a footnote to this topic, the income disclosure statement has an interesting sheet attached to it, it is the average annual salaries of popular careers. The average trucker makes $56,240, a bus driver $31,640, and a waitress $20,880 . The point is simple: the opportunity cost of spending your money and time in LIFE is a terrible financial decision, even waiting tables out of high school nets more money than pounding the pavement trying to fill your down line working for LIFE. All of these links are defensive links and provided by LIFE members. Orrin Woodward is the leader of LIFE and it isn’t obvious to the outsider but Bill Lewis is a founding member. The first article is a fluff piece, lending credence to the fact that LIFE feels like a cult. Woodward is more than just a suit at the top of a pyramid, he is trying to cultivate a cult following. Bill Lewis provides an ironic quote, he is right it is important to find facts and actual evidence. A rational decision maker faced with the proper information would see that LIFE is a terrible financial decision. It is amusing to watch LIFE unleash their questionable defence of the ‘pyramid’. The article “Lies lies lies and the life leadership scam” and the LIFE representative at the business pitch both attempted to defend the pyramid. The LIFE pitch man provided a pre-emptive defence of the pyramid without any sort of prompting from me. Their main point was “every organization is a pyramid” is true, but in most conventional pyramids you get “fairly” (at least minimum wage) compensated for your time and you often would not have to spend your time recruiting others for no pay. I think they are mistaking hierarchy for pyramids, hierarchy are a feature of human society, in all facets of life. 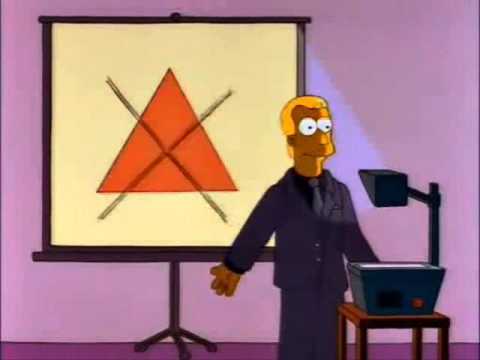 However the difference between a normal pyramid in Acme corp, verses a MLM pyramid is that a MLM pyramid has to grow necessarily, even exponentially for any of the lower echelons to expect payment. So while a pyramid is a hierarchy, not all hierarchies are pyramids in the MLM sense. The pyramid apologist makes the case that on paper all hierarchies are the same because of their geometry but this only makes sense if taken as a snapshot. A simple back-of-the-napkin math will show that the growth models necessary for YOU to make any serious amount of money is just simply unrealistic in a MLM. That being said if you look hard enough you can find criticism, such as this Facebook page that hints that there was an ugly legal battle. Any organization will attempt to deflect bad press, but the way that LIFE has done it, the fluffery of Orrin Woodward, the pyramid apologist, and if you spend time reading the comments, just makes it look like slightly clutish and very insular. Finally the LIFE narrative, “the financial Matrix” has cult characteristics. The financial matrix is itself a self-imposed matrix of sorts or like a religion. The Financial Matrix book is sort of a founding document for their beliefs and faith. The descriptive account provided in the book isn’t entirely wrong, but that doesn’t mean that it’s entirely right, unpacking the complexities of the economy is no simple task, it is no surprise that this book is unable to do that in 120 or so pages. This type of work fosters conspiracism, it requires belief and a leap of faith to make this belief system to work. This is especially true considering the income disclosures statements provided by LIFE. In other words, not everything LIFE hawks is false, but the conclusions are dead wrong, the people at the bottom (you) are unlikely to make any money working LIFE and you will not escape any matrix. If anything you are imposing your own matrix of ignorance and engaging in a disregard of actual evidence. The last dangerous aspect of this is the fact that it exists in the first place, that MLM as a tool didn’t burn out in nineties, but it still exists and is providing false promises to people. Looking at the statistics it is clear that being in a MLM is a poor financial decision, but the dangerous aspect is that is that it exists and is capable of tricking financially desperate people. In a whole different set of circumstances I could have caught the MLM bug and spent the next year of my life chasing my meagre ‘investments’. This is one of the worst business decisions you could ever make. The numbers don’t lie, LIFE is not a bet you should not take. From an opportunity cost perspective the $200-250 dollars it takes to buy a business kit could be spent in an innumerate amount of better ways. This is one of the worst business decisions you could ever make. I’ve seen some arguments that suggest MLMs are a good community building tool – any system that is predicated on members trying to leverage their social connections to hawk motivation materials isn’t a great community building system, schemes that require you to exhaust your social capital in order to make a buck only encourages predacious behaviour and makes a community worse off. Take the $200 that it takes to start a LIFE business and instead start a new hobby, donate it to a local charity or use that $200 on drinks at the local bar and get to know your community that way. I hope the LIFE rep eventfully ‘wakes up’ from the ‘financial matrix’ he created for himself. LIFE demands that you double down to try to recoup anything, like a problem gambler taking another spin, forever chasing it. Amthrax, a blog that is dedicated to illustrating the down side of LIFE. Multi-Level Marketing Unmasked [free Ebook] This is an update of the book “The Case against Multi-level Marketing – an Unfair and Deceptive Practice”. This free e-book is an excellent resource on MLMs and explores MLM in-depth. The Cult of MLM – An excellent article written by Robert L. FitzPatrick on the site False Profits, it is about the cult like characteristics of MLM. Instead of buying a useless $200 “starter kit”, that $200 could buy 6 shares of GE. Or some vanguard index funds. A clear misunderstanding of the business model wrapped all in one article for your misinformation. 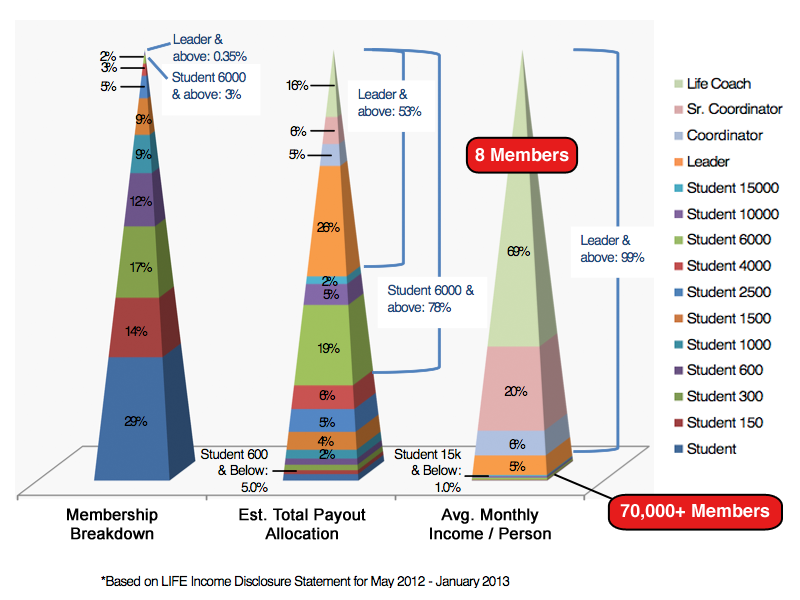 Yes, 1 in 50 people in Life Leadership generate a reasonable income of 2000 per month, but that’s because you need a customer/member base of 50 people in your business in order to reach the Leader rank. You say the average income of a Life member is is unacceptable if you are working it as a full time job. Problem is very few people work it as a full time job, and those that do make money. I broke even my first week, made $500 the second month, then $2000 my third month. Pretty good business decision if you as me. Hi Daryl, Thanks for commenting. I appreciate hearing from LIFE members. If you made the amounts you are claiming to be making in LIFE, then it looks like you are in the top percentile of LIFE and not representative of anything that anyone could expect at lower levels. The blog Amthrax suggest in their analysis of the income disclosure suggests that up to 97% of LIFE members are losing money because the annual business expenses of $500 outweigh whatever they make. Asides from your outlier case of making as much as you claim, how could anyone else see LIFE as a sensible business decision?